LABELLE — Environmentalists continued to take aim at a giant by using Earth Day to stand shoulder to shoulder, wave signs and call out to motorists on Hickpochee Avenue in LaBelle April 22. 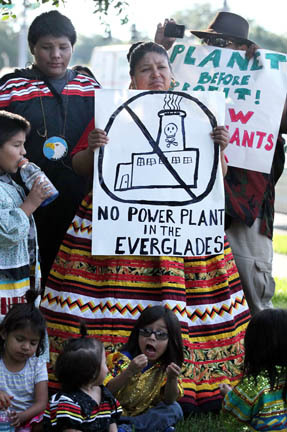 “Florida Power & Light (FPL) wants to build a power plant less than 2 miles from the Big Cypress Reservation and we do not want that to happen,” said Frank Billie, among the nearly two dozen protestors who appeared on Earth Day and the previous day to express dissent in front of the Hendry County Courthouse. Billie was one of several Seminoles at the afternoon protest led by members of Everglades Earth First! and attended by supporters from other environmental groups. The event doubled as an Earth Day rally with more than 75 protesters including Seminole and Miccosukee residents from Tampa, Big Cypress, Hollywood, Trail and Immokalee. Organizations represented were Sierra Club, Earth First!, South Florida Wildlands Association, Stone Crab Alliance, Coalition of Immokalee Workers, Save Our Creeks, Everglades Sawgrass Warriors and the Independent Traditional Seminole Nation. Demonstrators hoped to increase awareness about FPL’s plans to build a massive power plant on 2,300 acres of land near where the Seminole Tribe plans to build a high school. The plant will require 22 million gallons of water a day to be pumped from the Florida aquifer, Hendry County and the reservation’s main source of water. According to FPL’s 10-year plan, the plant would be a twin to the West County Energy Center in Palm Beach County – one of the largest energy plants in the United States and the biggest producer of greenhouse gasses in Florida. Tribe member Heather Billie, with her infant son in tow, said she is against what could turn the bucolic, country nature of the Big Cypress (BC) Reservation into a gray industrial town. “Everybody needs business, but BC is where people come to get away from that. It’s peace and quiet. It’s our home,” Heather Billie said. A lawsuit against FPL, Hendry County and McDaniel Reserve Realty Holdings (owned by developer Edward Garcia) is scheduled to be heard July 14 at the courthouse. The suit stems from allegations that zoning for the property was changed improperly, thus setting the stage for the power plant to be built. “If we don’t stand and fight against the power plant, why should anyone else,” Heather Billie said. Speakers echoed fears about the power plant and pleaded for a reversal of the zoning change. The land is a proven habitat for endangered Florida wildlife including wood storks, tortoises and Florida panthers. Tribal elders also contend that several archeological sites and medicine plants are within the area and nearby. Janet Spence, of South Pasadena near St. Petersburg, said she learned about the protest via Facebook. She and her friend Jim Lochead drove two hours to join the demonstration in favor of keeping Seminole tradition alive.